Jocelyn Koehler is a writer and editor in Philadelphia. She is published by Hammer & Birch. You can sign up for her mailing list for new release updates and possible freebies. Her books are available through Amazon, Barnes & Noble, Kobo, and Apple’s iBookstore. Her new book End to End, which follows The Way Through the Woods, is a collection of four fairy tales based in her mythical land of the Nine Kingdoms. She also blogs about books, movies, and writing over at Team Blood. Follow her on Twitter at @jocelynk414 to hear snarky comments and get links on writing-related topics, and friend her at Goodreads to see what she should be reading but clearly isn’t getting to, and on Facebook, because it’s…Facebook. She’s also a guest reviewer for Reads 4 Tweens. Jocelyn Koehler and I enjoy geeking about fairy tales–in fact, I’m honored to have proofread three of the tales in The Way Through the Woods and to have edited End to End, which includes “The Soldier Underground,” her own version of “The Twelve Dancing Princesses.” I was eager to get Jocelyn’s perspective on retellings of “The Twelve Dancing Princesses” since several have recently caught my eye. Entwined and The Thirteenth Princess are reviewed on this site. Reviews of Princess of the Midnight Ball and its sequels are coming soon. Amanda: I’ve always found the story of “The Twelve Dancing Princesses” to be somewhat problematic. There are many questions unanswered, and the hero often doesn’t marry the only princess who showed any personality at all (usually the youngest)—he marries the oldest so he can be king. What issues came up for you with this tale? Can you talk about some of the choices you made and why you made them? Jocelyn: This story definitely raises questions. How did they go underground the first time? Why does it have to be secret? Why so many princesses? Why a soldier instead of a prince? My biggest frustration with the original tale is that there usually wasn’t a reason given for why the underground kingdom was there in the first place. It also seems to be equally beautiful and sinister, so I wanted to capture both feelings in my version. Therefore, I made the soldier more of a detective, and he’s closer in age to the princesses (I pulled a little trick so the princesses’ ages were closer, too.) In most of the versions, the soldier is quite a bit older than the usual hero, and I think that’s why he ends up with the oldest princess. But most importantly, I chose to give the princes a much darker background than they usually have (they are often shown as pure illusions, victims, or aren’t explained at all). These characters have a reason to be there, and it isn’t very nice. My final twist to the story was to use an addiction metaphor to explain the pull of the underground kingdom. The princesses are clearly not at the peak of health, but they won’t (or can’t) stop dancing. We’ve all been in a place where we made a stupid decision despite knowing better, so I thought that would be something readers could identify with. ‘Cause let’s face it, sometimes it’s hard to identify with a princess. 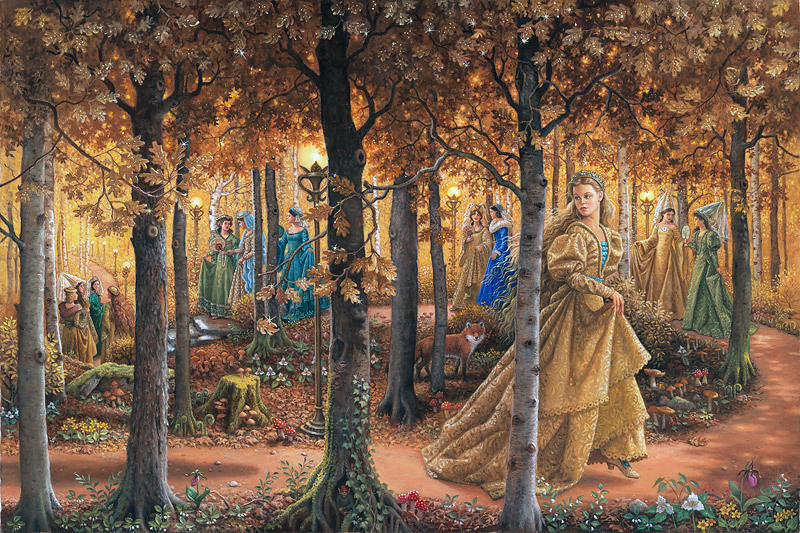 Amanda: I’ve recently seen a surprising number of retellings of this story, partially surprising because it doesn’t have a clear female protagonist, and for better or worse, most current fairy tale retellings focus on a female protagonist. As an author, what do you think makes this story appeal to fellow authors? What’s compelling about it for modern authors and modern audiences? Jocelyn: I think it’s alluring because it is so problematic, and because at its core, it’s a mystery. Though we’ve read it before, each time the reader still gets to discover the secret alongside the protagonist. There’s also a lot of room to play with the setting and the details of the curse (if it is a curse). The underground world really seems like it got borrowed from the Arabian Nights, somehow…Aladdin would fit right in. And of course, the writer gets not one, but twelve opportunities to describe fancy princess paraphernalia…gowns and hair and shoes, oh my! It’s like a never-ending prom. And you’re right that having a male protagonist is unusual for a retelling (though a lot of the traditional Grimm tales have male protagonists, or brother/sister pairings). In some of the retellings I’ve read, like Heather Dixon’s Entwined and Diane Zahler’s The Thirteenth Princess, the author makes the female lead a lot stronger (I think that in Entwined, it’s the oldest sister, and in Thirteenth, it’s the youngest). The men are there, but they’re less central. That is a very modern decision: it makes the princesses less passive, and of course, an overwhelming majority of readers for these tween- and YA-friendly retellings are female. Note: For a version of “The Twelve Dancing Princesses” where the role of the soldier is filled by a girl, see The Princess Curse. I get the initial trend, because I do like the idea of girls having more strong protagonists to look up to rather than passive/always getting saved girls. But, is the pendulum swinging too far the other way? Was the original audience of fairy tales more girls or was it equally mixed? Interesting discussion! The “original” audiences for fairy tales weren’t even just kids – these were stories for everyone. Then slowly they targeted kids, and then at some point they appear to have targeted girls in particular. I have a rant about that that I’ll be posting later this week. Jessica Banks also has a post that pertains to this: http://profbanks.com/?p=793. The whole “make guys look stupid to make girls look clever and strong” thing really ticks me off – it’s not fair to anyone. There are plenty of tales with male protagonists, but the ones we tend to be most familiar with have female protagonists. We can probably blame Disney for that, but that’s a chat for another day (I intend to write a bit about that, too). One thing that’s interesting about “The Twelve Dancing Princesses” is that it *does* have a male protagonist. Usually a common, clever, and kind one. Yet in most modern retellings, he’s lucky if he even shares the spotlight! I enjoyed Jessica Day George’s version, and the companion novels featuring two of the other princesses in their own tales. I’m also in love with Merrie Haskell’s THE PRINCESS CURSE. So read these authors if you haven’t already. I really liked ENTWINED as well, good choice. I like a lot of the points you brought up that I’ve never considered before. I think, if not handled well, the tale does have too many characters. Like you, I prefer the version where the soldier actually chooses the princess he loves, not one solely for profit. There was one time, I read a version where the soldier was a girl in disguise and marries the lone prince, which obviously wasn’t originally an option. I don’t even remember what that one was, possibly an online short or from an anthology…? I’ve been hearing good things about The Princess Curse. I’ll have to get my hands on that one. And I love the idea of the soldier being a girl in disguise!